Exceptional baby photography in Bristol. Highly qualified and experienced. Nine month old baby A came to play! I photographed baby A as a newborn baby and it was a joy to see him again! Babies grow so so quickly. It seems that within the blink of an eye they change. One moment they are a sleeping (or not!) newborn baby and the next they have their own personalities. Watching babies grow is always wonderful and photographing them even better! I love to capture these milestones. 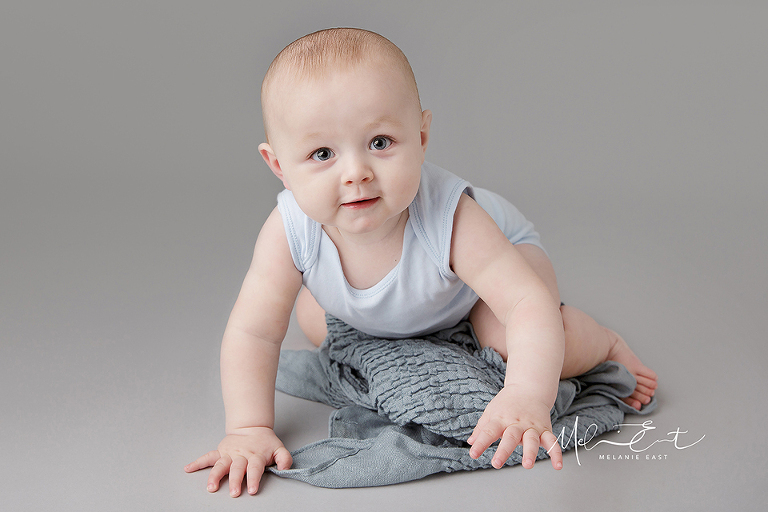 I love to photograph babies at their relevant stages, whether that is sitting, crawling, standing. Babies are full of personality and it’s great to have that professionally captured. I remember having my baby professionally photographed (I was not a photographer then), when she a nine month old baby and I still have her photographs from that stage in her babyhood on my walls (she’s now 16). Have your baby professionally photographed! Sure you have iPhone images of them, but those aren’t professional photographs, and I bet you probably didn’t print them? Or maybe you did, but nothing replaces professional photography! I know exactly how to get the best out of your baby. Sessions usually take around 45 minutes. I like finish on a high with the baby so that they do not get too tired as I also love for mum and dad to enjoy the experience. At this age plain colours work really well, and I love The White Company for pure classic baby clothes! Here is baby A! Isn’t he divine?! To take a look at my newborn and older baby photography please click here!